The iodine checks the iodine blood level to help screen for iodine deficiency. What is an iodine test? An iodine test measures the iodine blood level. Why is an iodine test important? The iodine blood test helps check for an iodine deficiency or iodine excess in the body. This Iodine Test is a blood test. The iodine test, also known as an iodine lab test, iodine deficiency test and iodine level test, measures the iodine blood level. Iodine is a mineral that is an important cause of thyroid dysfunction worldwide. Iodine is an essential component of diets and a public health issue due to its importance in the production of the major thyroid blood hormones. From a dietary standpoint, iodine is found in seafood and, in many countries, has also been added to common foods like table salt as a preventative measure. An iodine deficiency can cause a variety of problems in the body, including impaired mental function and abnormal breast enlargement. In an iodine deficiency state, the thyroid gland can not produce enough thyroid hormone because iodine, a raw material, is in low supply. As a result, the thyroid gland enlarges in an effort to enable more thyroid hormone production. This thyroid gland enlargement is partially the result of external stimulation of the thyroid gland by TSH which is why concurrent TSH testing is sometimes done with the iodine blood test. Additionally, testing of the important thyroid hormones T3 and T4 is also done frequently through the total T3 test and the total T4 test. Iodine testing can be done in conjunction with the hypothyroidism test panel is a lack of dietary iodine is suspected as a possible cause of symptoms related to an underactive thyroid. In extreme cases, an iodine deficiency leads to an enlargement of the thyroid gland called a goiter. Iodine supplementation via diet is an easy way to replace low iodine levels. If one is not careful, however, one can have too much iodine, leading to excess iodine in the body. In some cases, this can cause hyperthyroidism, or an overactive thyroid, which is why concern about an iodine excess leads to iodine testing in conjunction with hyperthyroidism testing. To get an iodine blood test near you, simply order online and get tested at the selected Quest lab location. 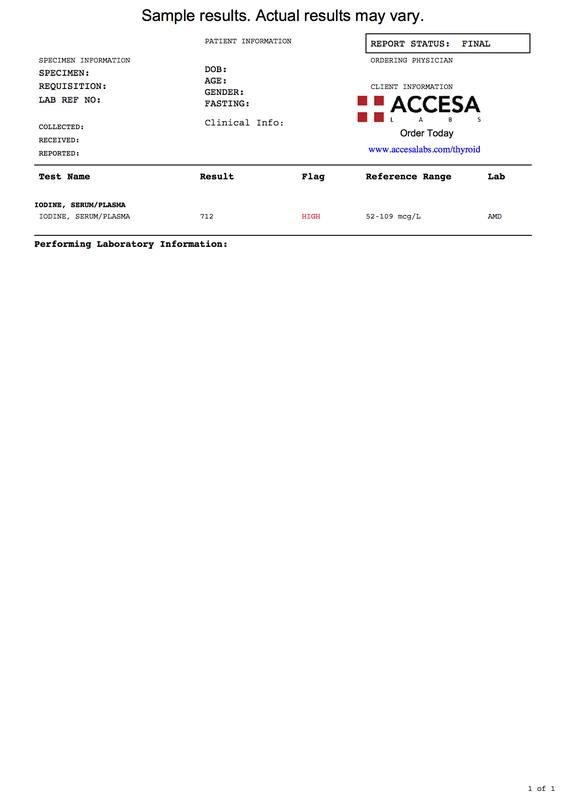 As can be seen on the sample iodine lab report above, iodine blood levels will be reported as a numerical result which can be compared against the iodine reference range provided by the lab. Iodine Test at Guaranteed Prices.